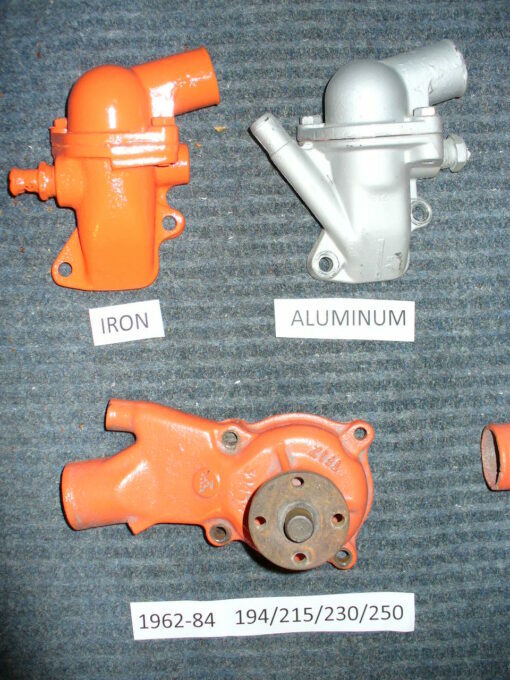 POWER STEERING BRACKET FOR 1962-89 153 194 215 230 & 250 GM INLINE ENGINES WITH NON-INTEGRAL HEAD. ADJUSTABLE FRONT TO BACK. PLAIN STEEL READY TO PAINT. COMES WITH HARDWARE & INSTRUCTIONS. NEWLY REDESIGNED POWER STEERING BRACKET FOR 1962-84 153 194 215 230 250 GM INLINE ENGINES. “READY TO PAINT” CONDITION. JUST WIPE DOWN WITH SOLVENT AND PAINT. 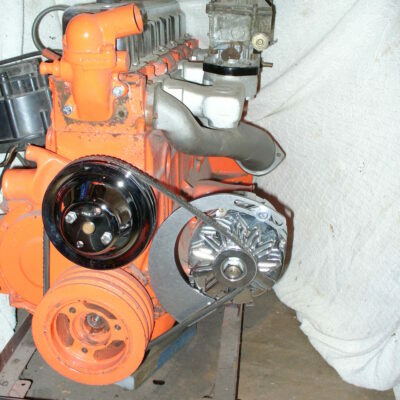 1) 153 194 215 230 OR 250 ENGINE. 2) SAGINAW POWER STEERING PUMP. 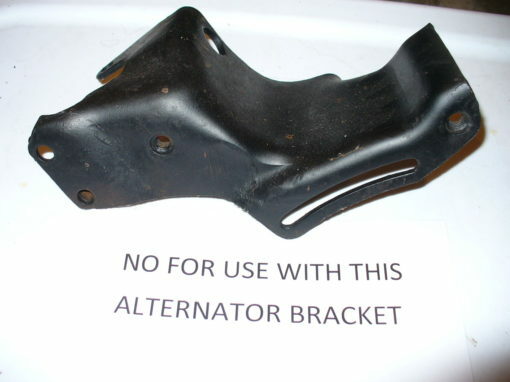 4) APPROPRIATE UPPER ALTERNATOR BRACKET (SEE PICS). 5) 2 GROOVE BALANCER & WATER PUMP PULLEY. (SEE NOTES BELOW). 1) 292 ENGINES USING 292 WATER PUMP. PLEASE SEE 10003 OR 10004 INSTEAD. 2) ENGINES WITH INTEGRATED CYLINDER HEAD. PLEASE SEE 10058 INSTEAD. 4) TRYING TO RUN BOTH PS & ALT ON SAME SINGLE BELT. NOT ENOUGH BELT WRAP ON ALT. (SEE NOTES BELOW). 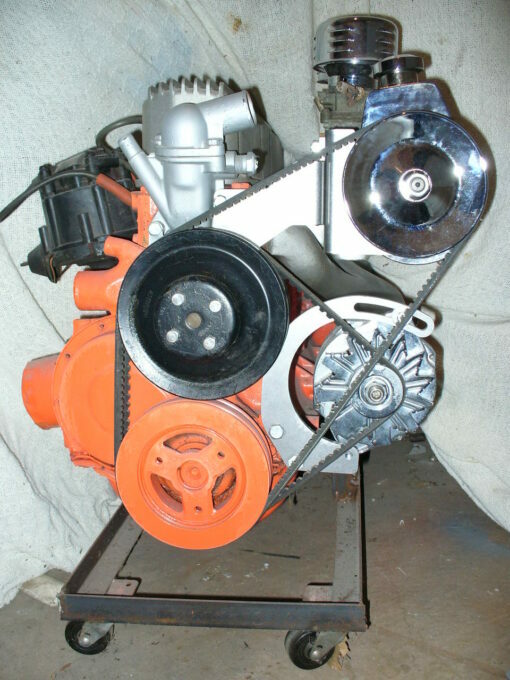 PUMP CAN BE ADJUSTED FRONT TO BACK TO ALLOW FOR DIFFERENT PULLEY ARRANGEMENTS. CAN BE USED ON A 292 IF IT HAS BEEN CHANGED OVER TO A 250 WATER PUMP AND THERMOSTAT HOUSING. 10002 DOES NOT INCLUDE PUMP, PULLEYS OR BELTS. WORKS WITH STOCK & AFTERMARKET EXHAUST MANIFOLDS & HEADERS. WORKS WITH BOTH 5-1/2″ & 7″ WATER PUMP PULLEY SIZES. TO CHANGE TO 2 GROOVES, THEN PLEASE SEE PART 10005 INSTEAD. PLEASE SEE 10005 INSTEAD. NEED THE AC BRACKET AS WELL? THEN SEE 10008. BELTS AS SHOWN IN PICTURES. 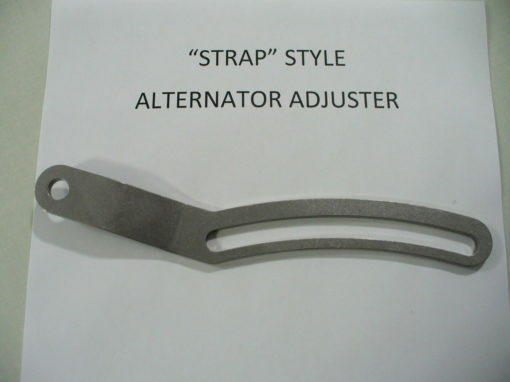 ALTERNATOR BRACKETS, PART 10000 OR 10022. 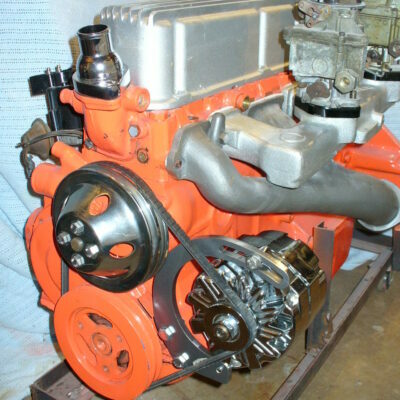 A 2 GROOVE OR A DEEP 1 GROOVE PULLEY ON THE PS PUMP WILL HELP GIVE THE FRONT CARB MORE ROOM. 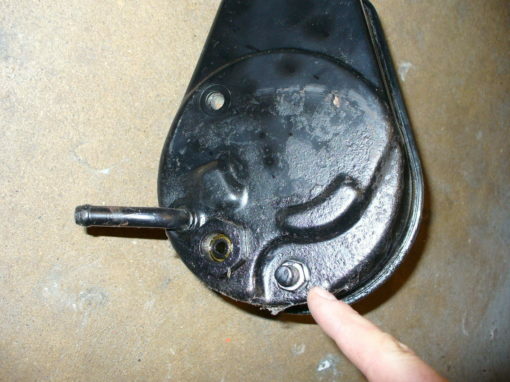 PS PUMP NEEDS A STUD NEXT TO THE PRESSURE HOSE CONNECTION AS SHOWN. DO NOT USE A STUD AT ANY OTHER LOCATION. 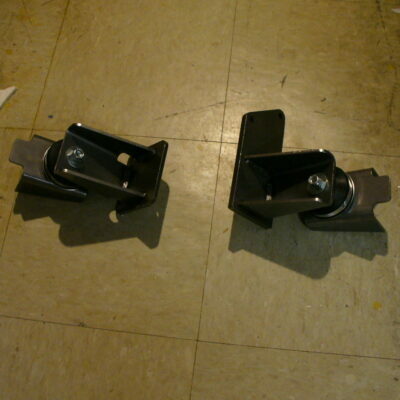 Brackets for 292 engines are also available. If you are wondering what to do for a 2 groove setup, if you have the 2 groove balancer WITHOUT the wide space between grooves, then a 2 groove water pump pulley from a small block V8 will work. 1955-68 for the small fan bolt pattern, 1969-up for the large fan bolt pattern. 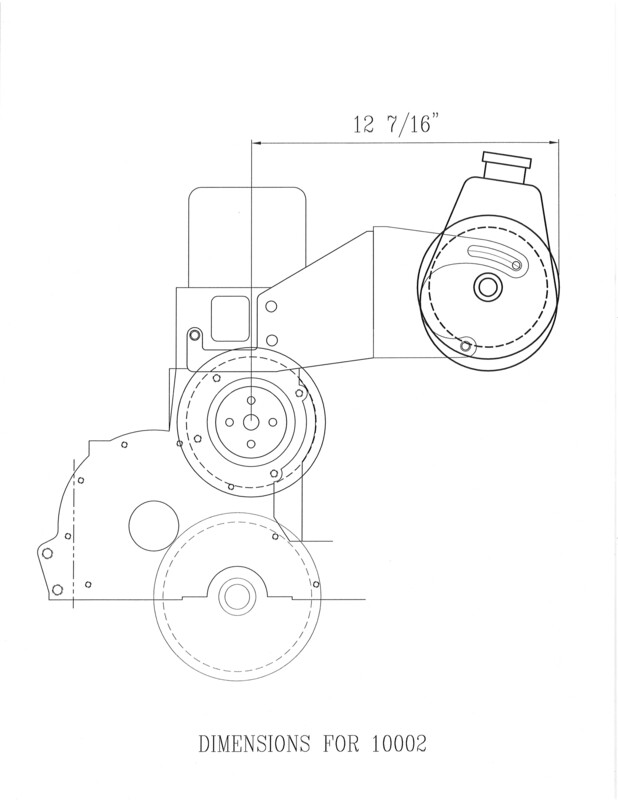 For pulleys with the wider 1/2″ space between the grooves, you will need to find an original pulley (1975-84 250).